Triumph Tulips are the result of hybridizing single-early and late flowering tulips. The largest and one of the most important classes of Tulips, they come in every shade of color possible for tulips, including some wonderful pastels. Excellent for forcing indoors or for use in the front border, they are particularly esteemed for their classic "tulip" flower shape. 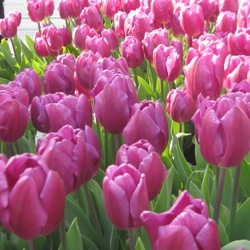 Triumph Tulips have sturdy stems and will withstand windy weather. April-Early May. 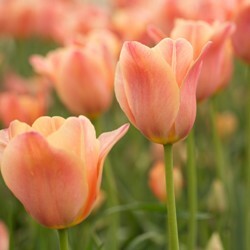 Apricot Beauty Triumph Tulip is a soft apricot-rose color, lightly scented. Often found in cut flower arrangements. 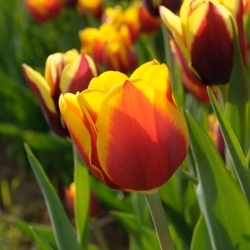 Kees Nelis Triumph Tulip has luminous red flowers with orangey-gold margins. Bowl-shaped blooms on sturdy stems. 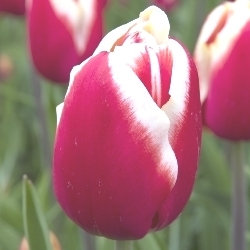 Kung Fu Triumph Tulips is a nice two-toned flower, with satiny brilliant red color trimmed in white. They have strong stems, and so are highly wind-resistant. 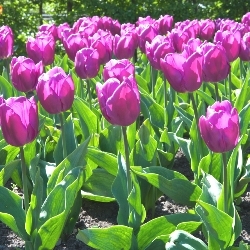 Negrita is a stunning, deep plum purple Triumph Tulip. Gorgeous planted along with Silver Dollar, below. 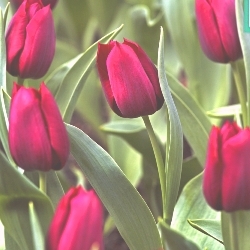 Pallada Triumph Tulips are hybrids with a deep garnet red color. Tall. Flowers early to mid spring. 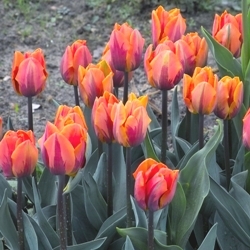 Named for a Dutch princess, Princess Irene Triumph Tulip is a vivid orange, flamed with purple. Lightly scented. Excellent as a cut flower. Long lasting, disease resistant and richly colored. Strong Gold Triumph Tulips wear their name well with strong stems topped with golden blooms. 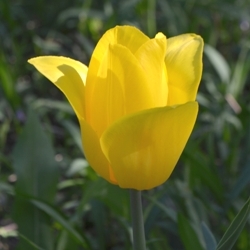 A long-lasting cut flower, it has a primrose-yellow exterior and a canary-yellow interior. 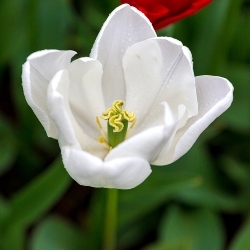 Wildhof Triumph Tulips are a pure white color. Provides brilliant contrast when planted with Negrita or Don Quichotte. Mixed Triumph Tulips – a mixture of the above Triumph Tulip varieties. A collection of Triumph Tulips: 20 each of Pallada, Strong Gold and Wildhof. Individually packaged and labeled.